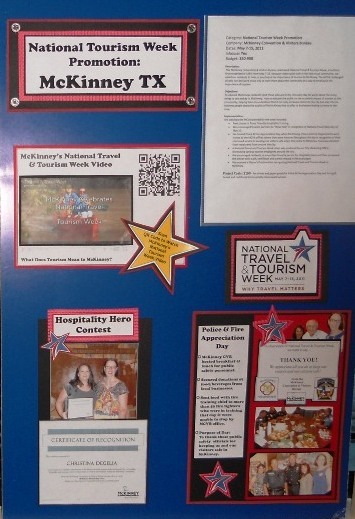 The McKinney Convention & Visitors Bureau received two First Place Awards in their budget category — for Cooperative Marketing and National Tourism Week Promotion– during the Annual Texas Association of Convention & Visitors Bureaus (TACVB) Conference held last week in San Marcos. 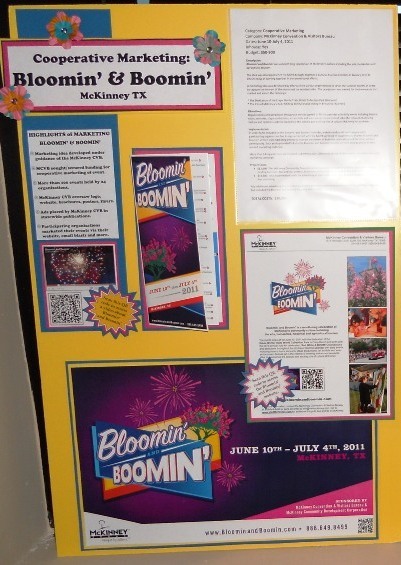 The First Place award for Cooperative Marketing recognized the MCVB’s creation and promotion of Bloomin’ and Boomin’, the month-long marketing campaign celebrating McKinney’s community culture featuring the arts, humanities and agricultural tourism. The First Place award for National Tourism Week Promotion rewarded the MCVB’s recognition and celebration of National Travel & Tourism Week, held annually the second week of May. The MCVB started off the week with a proclamation from Mayor Brian Loughmiller, declaring it National Travel & Tourism Week in McKinney. MCVB staff also facilitated a half-day Texas Hospitality class to help teach store owners, business people and others about how to provide the best Texas hospitality to visitors and residents alike. The second half of that week, the MCVB turned their attention to those in the community who serve visitors and residents. Bayes and her staff especially appreciate awards from the TACVB because of the nature of the competition. About the TACVB: The Texas Association of Convention & Visitors Bureaus was established in 1972 to provide cooperative action and exchange of ideas between the CVBs of Texas cities, to maintain professional standards within the tourism marketing industry, to unify legislative and public relations efforts among the cities, and to provide quality continuing education opportunities for its members. About the McKinney CVB: The McKinney Convention & Visitors Bureau’s mission is to promote McKinney as the destination of choices. Its vision is to generate economic impact by promoting and developing McKinney as a premiere destination for business and leisure travelers, so they fully experience McKinney’s historic charm and friendly unique atmosphere. The McKinney Convention & Visitors Bureau is located on the first floor of the Heritage Premier building at 1575 Heritage Drive, and is open Monday through Friday from 8 a.m. to 5 p.m. For more information, call 214-544-1407 or toll-free 888-649-8499, or consult www.VisitMcKinney.com.